Another central agency change here as International Yacht Collection sends news that Mark Elliott and Philip Bell have taken over the listing for the 29.6m motor yacht Kakawi. Delivered in 2011 by Marlow Yachts, her twin Caterpillar engines have less than 200 hours on them, and she cruises at 20 knots. 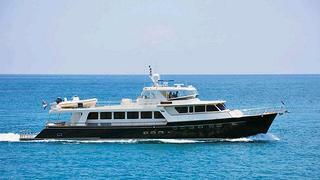 Bureau Veritas classed, Kakawi accommodates up to 10 guests in a master suite, two VIP staterooms and a twin cabin. Available to view in Newport, Rhode Island, Kakawi is asking $5,850,000.